Beautiful, high-quality, sturdy back packs are just the right size for younger children. Bold colors and designs. Great for school, camp, or travel. 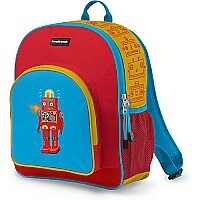 Back packs are 11.5"W X 14" H. For ages 3-8. Crocodile Creek products conforms to all of the appropriate safety standards.